Last week I tried thinai idli recipe for the first time using fermentation method.Earlier i tried an Instant Foxtail millet idli which was a super flop .But this recipe worked out very well.Idli came out soft and spongy.I made idli as well as dosa with this batter.Its taste & texture was more like our usual idli,dosa.Only its color was not white.We were very happy to have a healthy breakfast recipe & i was even more happy as i have got yet another interesting idli recipe to include in my idli varieties.In other languages,Thinai is called as ”Foxtail millet” in English,”Navane” in Kannada,”Kakum”in Hindi,”Korra” in Telugu,”Thina” in Malayalam,”Kaon” in Bengali,”Kang” in Marathi & Gujarati and ”Kanghu” in Oriya. 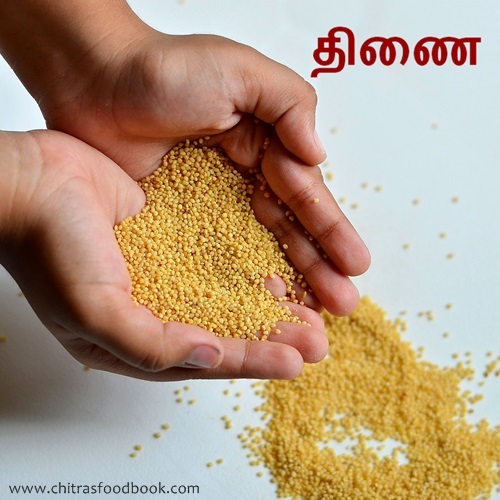 Last year few readers told me to post some quinoa recipes & I was thinking that quinoa in called as Thinai in Tamil.But when I googled, I found quinoa & thinai (foxtail millet) are different.I will try to buy quinoa in Bangalore and try to post some healthy recipes with it.But before that,i wanted to share this easy and healthy millets recipe which is a great replacement for our rice idli.Please check this link to know more details about “Thinai & its health benefits” with pictures.Lets see how to make thinai arisi idli recipe .Soon i will share some more interesting recipes with other millets too.Don’t forget to check out my Mixed millet laddo recipe & other millet recipes . 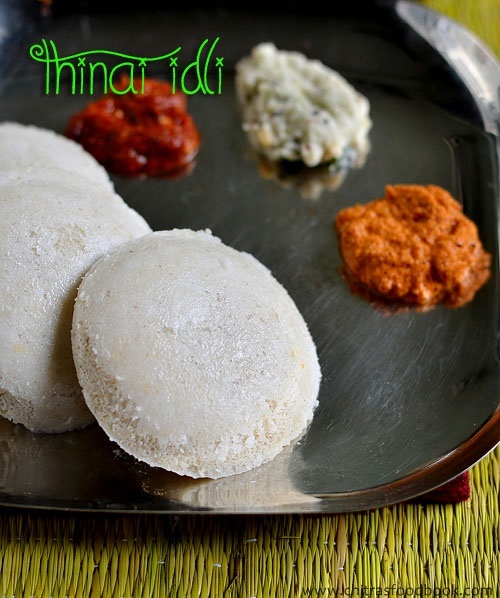 Idli recipe using Foxtail millet - Healthy breakfast recipe ! Measure & take all the ingredients together and wash it carefully .Its better if u wash it using a strainer.Soak for 3-4 hours. Grind them to a smooth paste adding required water and salt.Remove mix well and allow it to ferment overnight or minimum 8 hours. The next day,batter would have raised well(Not doubled).Now mix the batter very well and pour in a idli plate. Boil water in a idli pan and keep the plates.Steam it for 10-15 minutes.Check with the back of a spoon for doneness.If the spoon comes out clean,idli is ready. Remove the idli plate and rest it for 2-3 minutes before removing them else it will be sticky. 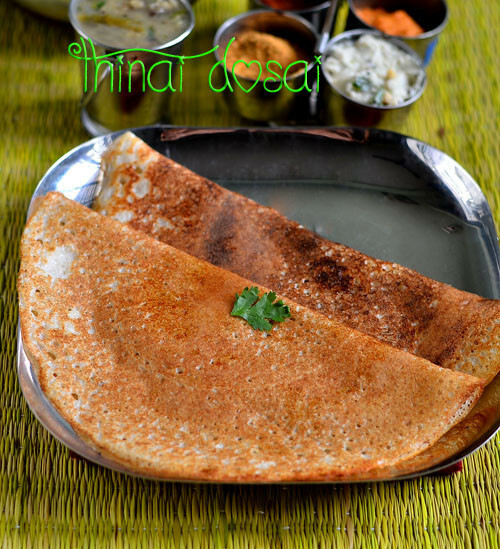 Refrigerate the batter & make dosas the next day. This batter becomes sour very quickly so refrigerate it after 8 hours till u use. Do not use more urad dal than the mentioned quantity because idli will become sticky. Do not remove the idlis if its very hot.It may be sticky.Give a standing time of 2-3 minutes before u remove. If the quality of urad dal is too bad,use little more than 1/2 cup.Similarly if the quality of dal is too good,use 1/3 cup.It varies. U can also make dosas using the above batter. Do Check out my Mixed Millet laddu recipe & other millet recipes if interested ! Enjoy this healthy foxtail millet/thinai idli for breakfast with your favourite chutney and sambar ! 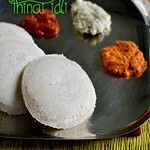 Wow nice recipe Chitra will sure do io it soon n let u know,than idli dosa looks very tempting. Love to start my day with this fantasticspongy idlies. Yes Bala Jayaseelan.Its my daughter's hands :) Thanks for ur sweet words. can i use brown rice in place of idly rice .if yes what is the quantity ? I prepared idli batter and dosa better with same measurements..but for idli batter I used idli rice along with fix tail millet and for dosa,i used dosa rice , foxtail millet,but omitted poha..my question is , batter has fermented well , but the smell of idlis were different when cooked..y is it..